Liu Yandong, ethnic Han, native of Nantong, Jiangsu Province, born in November 1945. Joined the CPC in July 1964 and began working in March 1970. Graduated from the School of Administration of Jilin University, majoring in political science. With a part-time postgraduate education, she holds the title of LLD. Member of the Political Bureau of the CPC Central Committee, vice chairwoman of the Tenth CPPCC National Committee and member of its Leading Party Members' Group, and head of the United Front Work Department of the CPC Central Committee. 1964-1970: Student and political instructor of the Department of Engineering Chemistry of Tsinghua University. 1970-1972: Worker, technician and workshop head of Kaiping Chemical Plant in Tangshan, Hebei Province. 1972-1978: Worker of Beijing Chemical Experiment Plant, staff member of the publicity section of its Party committee, secretary of a workshop Party branch, member of the standing committee of the plant's Party committee, deputy chief and chief of its political department. 1978-1980: Deputy secretary of the Party committee of Beijing Chemical Experiment Plant. 1980-1981: Cadre of the Organization Department of the CPC Beijing Municipal Committee. 1981-1982: Deputy secretary of the CPC Chaoyang District Committee of Beijing. 1982-1991: Member and executive member of the Secretariat of the Central Committee of the CYLC, vice chairwoman and chairwoman of All-China Youth Federation. 1991-1995: Deputy secretary general of the United Front Work Department of the CPC Central Committee, chairwoman of the All-China Youth Federation, deputy head of the United Front Work Department of the CPC Central Committee (1990-1994: part-time student majoring in theories and methodology of sociology at the Department of Sociology of Renmin University of China, where she received her master's degree). 1995-1998: Deputy head of the United Front Work Department of the CPC Central Committee, secretary of the Leading Party Members' Group of the Central Socialist Academy. 2001-2002 Deputy head of the United Front Work Department of the CPC Central Committee (ministerial rank), secretary of the Leading Party Members' Group of the Central Socialist Academy, vice president of Soong Ching Ling Foundation. 2002-2003: Head of the United Front Work Department of the CPC Central Committee, secretary of the Leading Party Members' Group of the Central Socialist Academy, vice president of Soong Ching Ling Foundation. 2003-2005: Vice chairwoman of the Tenth CPPCC National Committee and member of its Leading Party Members' Group, head of the United Front Work Department of the CPC Central Committee, vice president of Soong Ching Ling Foundation. 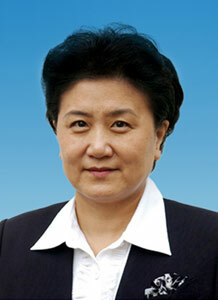 2005-2007: Vice chairwoman of the Tenth CPPCC National Committee and member of its Leading Party Members' Group, head of the United Front Work Department of the CPC Central Committee. 2007-: Member of the Political Bureau of the CPC Central Committee, vice chairwoman of the Tenth CPPCC National Committee and member of its Leading Party Members' Group, head of the United Front Work Department of the CPC Central Committee. Alternate member of the Fifteenth CPC Central Committee, member of the Sixteenth and Seventeenth CPC Central Committees, and member of the Political Bureau of the Seventeenth CPC Central Committee. Member of the Standing Committee of the Seventh National People's Congress. Member of the Standing Committees of the Sixth, Eighth and Ninth CPPCC National Committees, and vice chairwoman of the Tenth CPPCC National Committee.